Rome is the city of fountains and squares. 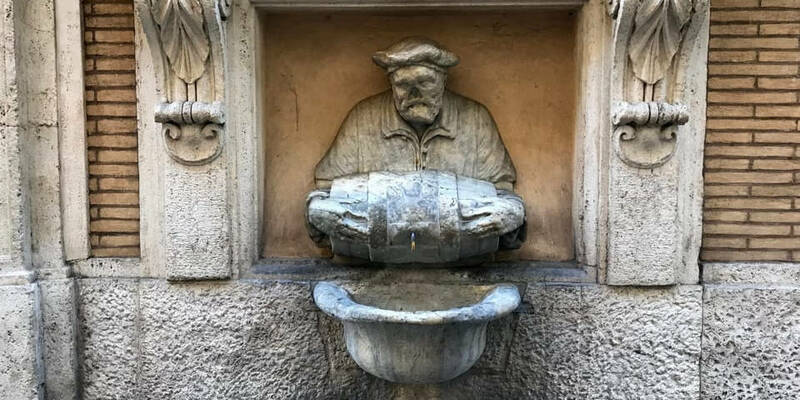 There are about two thousand fountains from different centuries located in small or spacious piazzas with rich history. Piazza Navona is one of the most popular and refined squares in Rome. In ancient times, the athletic stadium was located on this spot of the metropolitan land and Romans were watching the “agones” or the “games”. 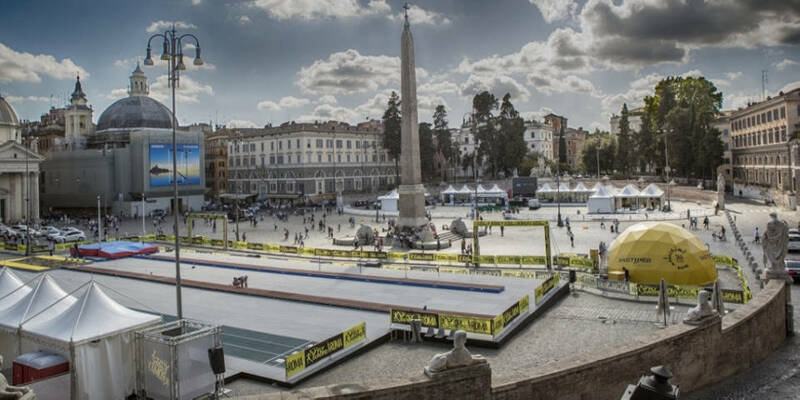 That is why Piazza Navona was previously known as “Circus Agonalis” or “competition arena”. Today, the square is crowded with tourists, who are willing to have a look at baroque fountains and ancient temples. A great variety of souvenir shops that are placed all along the square help tourists to cherish the memories of Rome and its beauties. Moreover, famous Fountain of the Four Rivers located in the piazza. 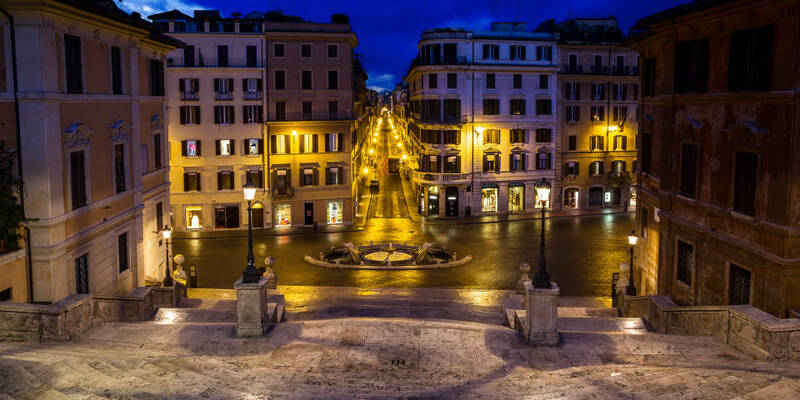 If you want to live in the famous square of the city, read more about the best hotels in the Piazza Navona. 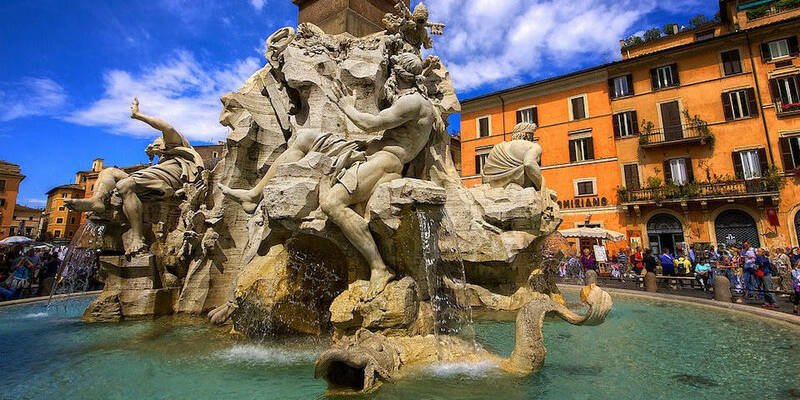 The Fountain of The Four Rivers (Fontana dei Quattro Fiumi) by Gian Lorenzo Bernini inaugurated in 1651. It was commissioned by Pope Innocent X and located in the Piazza Navona in Rome. Statues of the fountain symbolize four major rivers of that time: the Nile, the Ganges, the Danube, and the Rio de la Plata. Bernini’s masterpiece stands in front of the church of Sant’Agnese in Agone, a work of Borromini. The Fountain of Neptune located at the north end of the Piazza Navona. Previously, it was called “Fontana dei Calderari” because of the location near a small alley with different metal based businesses. 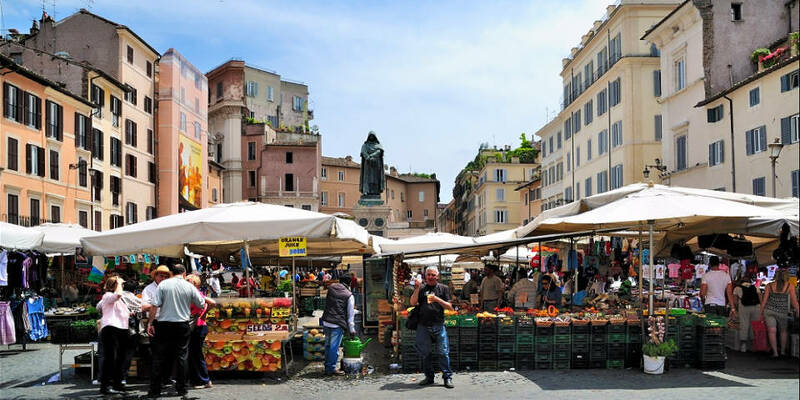 The Campo de’ Fiori is one of the main squares of the Eternal city. It is popular because of its flower, fruit and vegetable market during the day time and for its restaurants and shisha bars at night. Many hotels, BnBs, and artisan workshops fill the area and it is one of the most famous parts of the Eternal City. Moreover, many gelaterias located nearby the Campo dei Fiori. The Spanish Steps located on the top of Pincian Hill right to the foot of Spanish Square (Italian: Piazza di Spagna). The square attracts thousands of visitors of the Italian capital and its steps serve as a main source of inspiration to cinematographers and artists. Moreover, all famous brands as Prada, Bulgari, Dior located in the square or within a short foot walk. 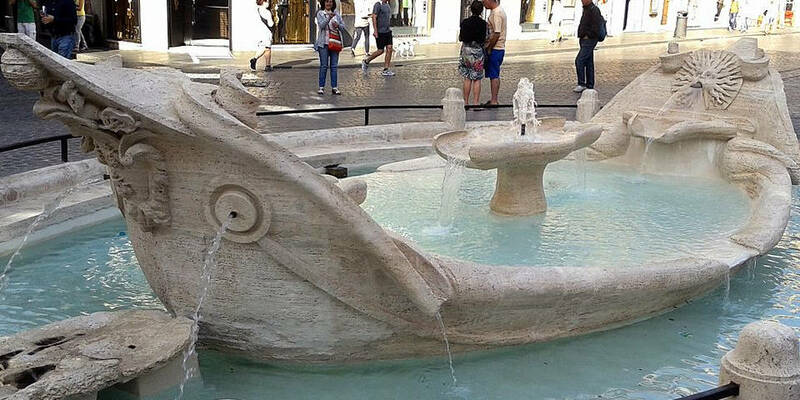 The Fountain of the Boat (Fontana della Barcaccia) is a Baroque-style fountain near the Spanish Steps. 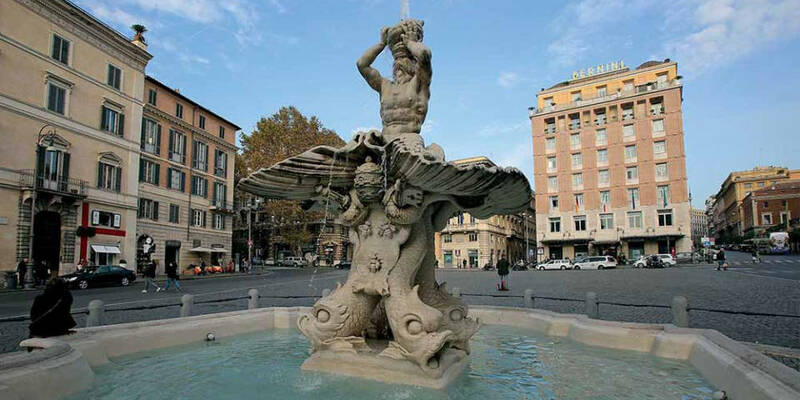 Pietro Bernini built the fountain in 1623 as part of a prior Pope’s Urban VIII project to create a fountain in every major square in Rome. The fountain was finished between 1627 and 1629. 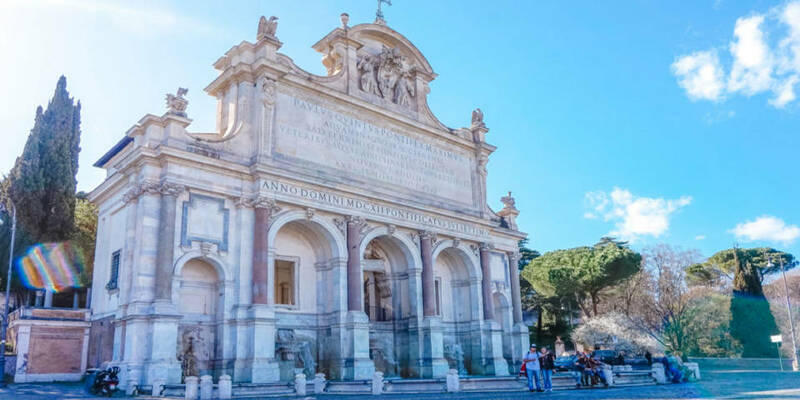 Piazza of Santa Maria in Trastevere is in one of the most famous touristic areas for its great restaurants and international or speakeasy bars with inexpensive prices. It is possible to reach the square within a foot walk from the historical center. Every evening there are many people who come to eat Italian gelato or visit one of the restaurants located in the piazza. Moreover, there are shows by street artists every evening. 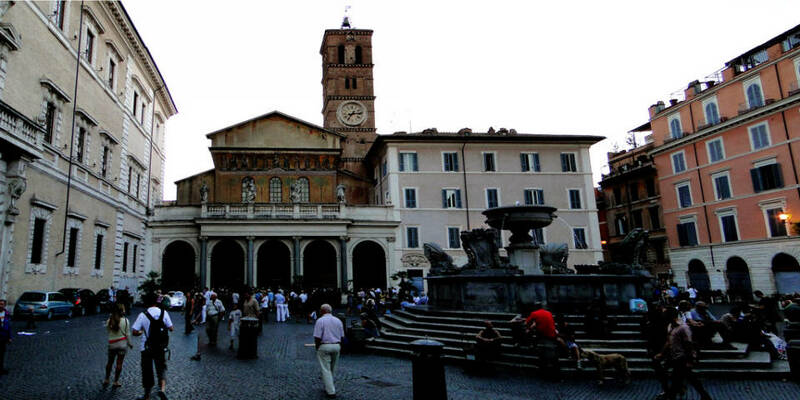 Famous Basilica of Santa Maria in Trastevere is in this square. The Fountain in Piazza Santa Maria in Trastevere located in the square in front of the church of Santa Maria in Trastevere. 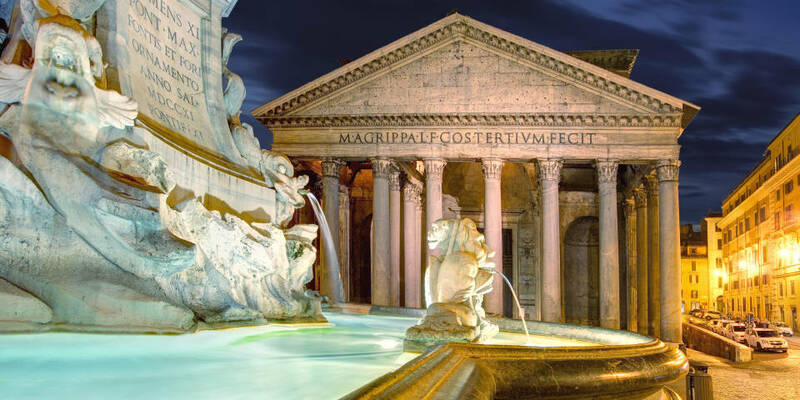 There is a belief that it is the oldest fountain in Rome, which dates back to the 8th century. The current fountain made by Donato Bramante, with later additions by Bernini and Fontana. Piazza del Campidoglio is located on the top of the Capitoline Hill in Rome and designed by Michelangelo Buonarroti in 1538. Roman Divinities were once praised there, while today, it is headquarter of the Italian government. There are three main buildings: Palazzo Senatorio, Palazzo dei Conservatori, and Palazzo Nuovo. Located in the Piazza del Campidoglio, the fountain was created by Michelangelo in about 1536 and it is also known as the “Senate Steps” or “Pallas Kidnapped.” At the beginning, Fontana della Dea wasn’t intended as a fountain because water didn’t reach the square until up to fifty years later. Rather, it considered as a superb ornament in Piazza del Campidoglio. Piazza della Rotonda is one of the most popular squares in Rome because this is the site where the Pantheon located. Moreover, there is a beautiful fountain, surrounded by different restaurants and gelaterias. 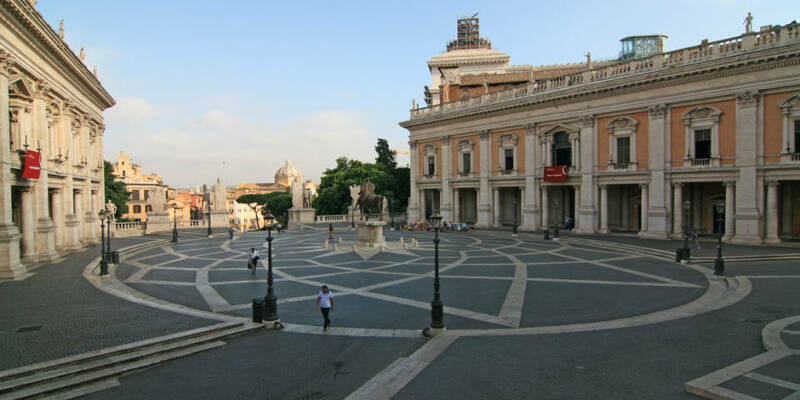 The square is in the historic center and easy reachable from most important Roman sites. 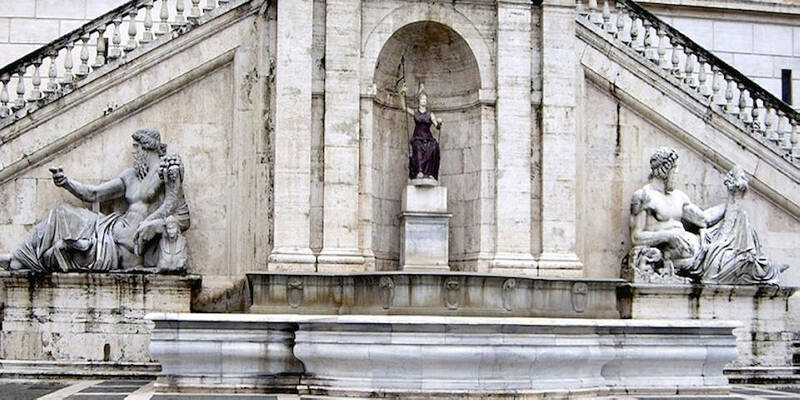 Fountain of the Rotonda Square (Fontana di Piazza della Rotonda) was constructed in 1575 and made from marble. Its architect is Leonardo Sormani, while the design belongs to Giacomo della Porta. 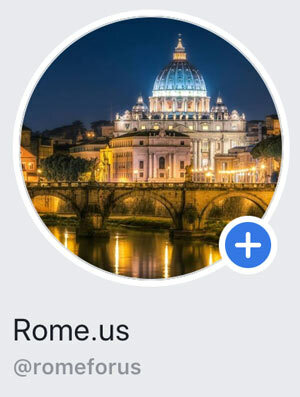 Saint Peter Square is world-wide famous because of the Basilica di San Pietro, the largest church in the world and symbol of the Vatican, located there. During the day time there are too many tourists and you should better visit the square during the night time or at dawn. Piazza del Popolo located between the Pincio district and the banks of the Tevere. There are churches, a fountain, monuments, ancient and modern marble memoirs on the square. It was rebuilt by Valadier architect in 1834, who designed two half laps to the obelisk. Moreover, Piazza del Popolo considered one of the largest squares in Rome and is almost perfectly symmetrical. Piazza della Madonna dei Monti is the small square popular among young locals and tourists on warm summer evenings. It would be a great choice to spend an evening there with a group of friends or come to one of the restaurants located on the square for the Sunday brunch. Fountain of the Catechumens (Fontana dei Catecumeni) deisgned by Giacomo della Porta and executed by Battista Rusconi for Pope Sixtus V Peretti in 1588-89. Additionally, its steps were built by Girolamo De Rossi in 1595. Moreover, the fountain was restored for Innocent XI Odescalchi in 1680 and then in 1880 and 1997, when the square became pedestrian. 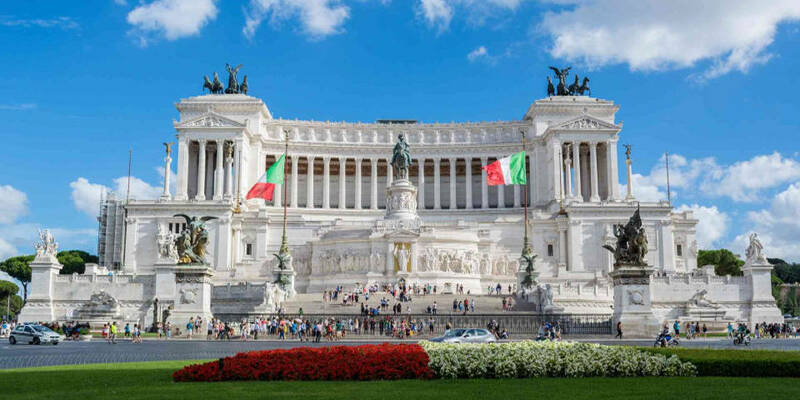 Piazza Venezia or Venice Square located in the center of four major roads of Rome. These roads are the Via del Corso, Via del Plebiscito, Via di Teatre Marcello, and Via dei Fori Imperiali. Also, the square is famous for its chaotic traffic. Piazza Venezia was named after the Cardinal Venezia, who ordered the construction of his own place, Palazzo Venezia, in 1455. 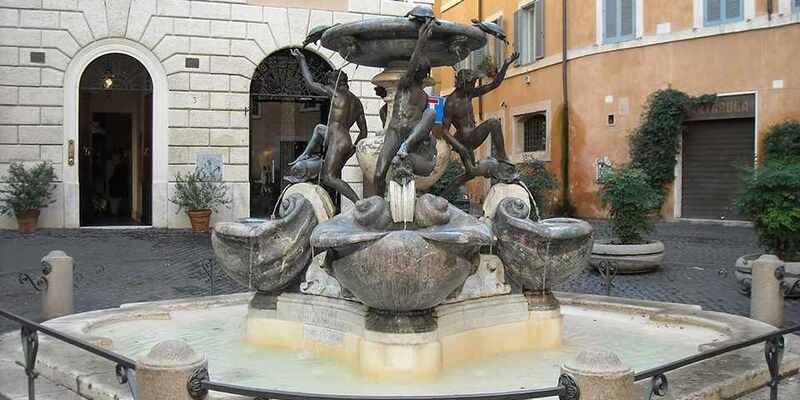 Located in beautiful Jewish Ghetto, Piazza Mattei is a quiet square with famous The Turtle Fountain (Fontana della Tartarughe). This square gives a sense of peace and tranquility at any time of the day. The Turtle Fountain (Fontana della Tartarughe) is a fountain of the late Italian Renaissance. It was built between 1580 and 1588 by Giacomo della Porta and Taddeo Landini. The bronze turtles around the upper basin were included during the restoration of the fountain in 1658-59 and attributed to Gian Lorenzo Bernini or Andrea Sacchi. Piazza Barberini is a large square in the historic center of Rome, situated on the Quirinal Hill. Originally, it was created in the 16th century, but buildings that surround the square went through several restorations over the time. Today, there are luxury hotels, bars, restaurants, and a cinema. Triton Fountain (Fontana del Tritone) located at the centre of Piazza Barberini and was sculpted by Bernini. 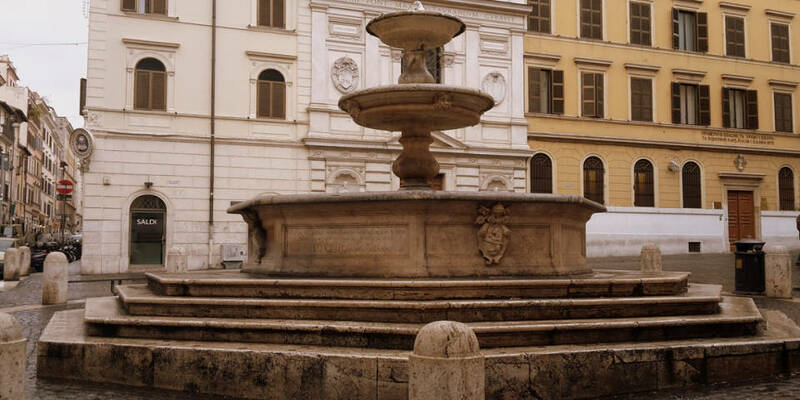 The fountain is located near the entrance to the Palazzo Barberini, which houses the Galleria Nazionale d’Arte Antica that Bernini helped to design for the Urban’s family. There is a large muscular Triton at the centre of the fountain, depicted as a merman kneeling on the sum of four dolphin tailfins. Piazza della Repubblica located next to the Termini station. One of the main streets of Rome – Via Nazionale, starts from this square. Its former name was Piazza dell’Esedra because it originates in the large exedra of the baths of Diocletian. The basilica of Santa Maria degli Angeli e dei Martiri is based on a wing of the baths. Fountain of the Naiads located in the center of the Piazza della Repubblica.The original Baths of Diocletian included the space which is now occupied by the fountain. Its main feature is in four Naiads (nymphs) located at the edge of the Naiad Fountain. Piazza del Quirinale loated on the tallest of the seven hills of Rome, Quirinal Hill. It offers impressive views of the city. Moreover, there is the obelisk located next to the statues on which Castor and Pollux, patrons of horse riders, are taming several horses. The Palazzo del Quirinale located on the square, was designed as a summer residence for Pope Gregory XIII in 1573 and became the royal family residence after the unification of Italy. The Fontana dei Dioscuri set opposite the Palazzo del Quirinale. The new fountain was placed in 1818 in the square. 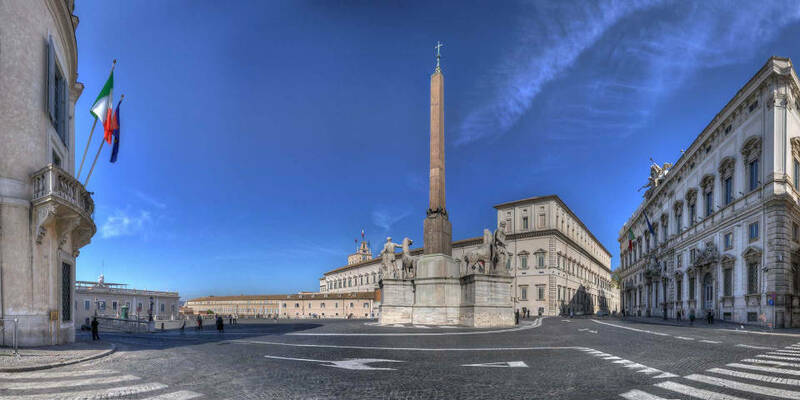 It was commissioned by Pope Pius VII and was designed by Raffaele Stern. The most famous and remarkable among hundreds of different fountains in Rome is considered to be the Trevi Fountain (Italian: Fontana di Trevi). 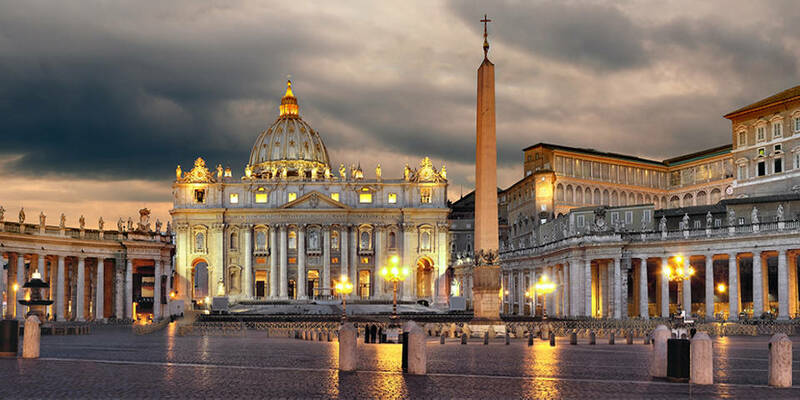 It has a perfect location, incredible beauty and attracts thousands of visitors of the Italian capital. The Fontana dell’Acqua Paola also known as Il Fontanone (“The big fountain”) located on the Jianiculum (Gianicolo) Hill, right near the church of San Pietro in Montorio. It was built in 1612 and marks the end of the Acqua Paola aqueduct. The fountain was restored by Pope Paul V, so its name goes from him. 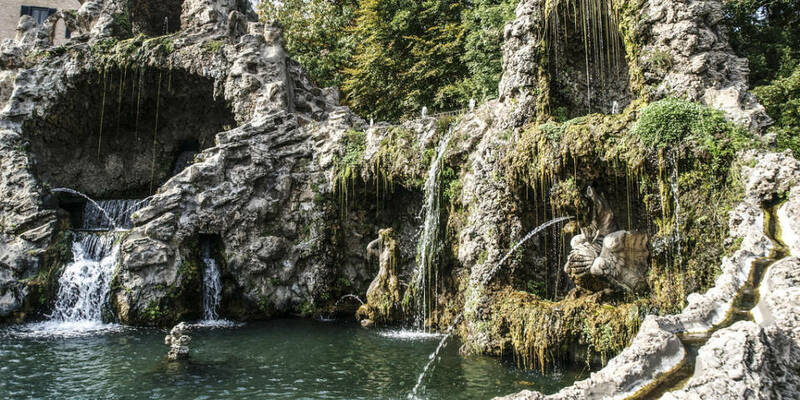 The Fountain of Eagle (Fontana dell’Aquilone) located in the Vatican gardens, was commissioned by Pope Paul V and designed by Vasanzio. 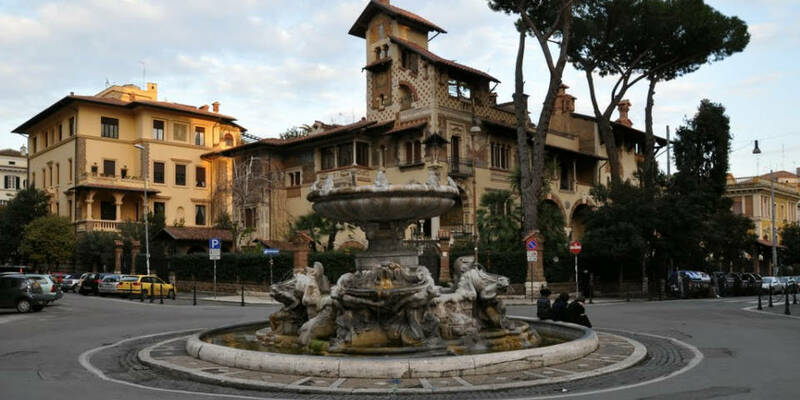 The fountain was built near Casino di Pio IV, which is a small residence designed by Pirro Ligorio in 1561 for Pope Pius IV. The Fountain of Frogs (Fontana delle Rane) is a baroque bowl fountain created in 1924 during the building of the Coppede neighborhood. There are eight frogs on the top of the bowl, where water enters the fountain from their mouths and from a central spray. The Porter (Italian: Il Facchino) is one of the talking statues of the Eternal City. 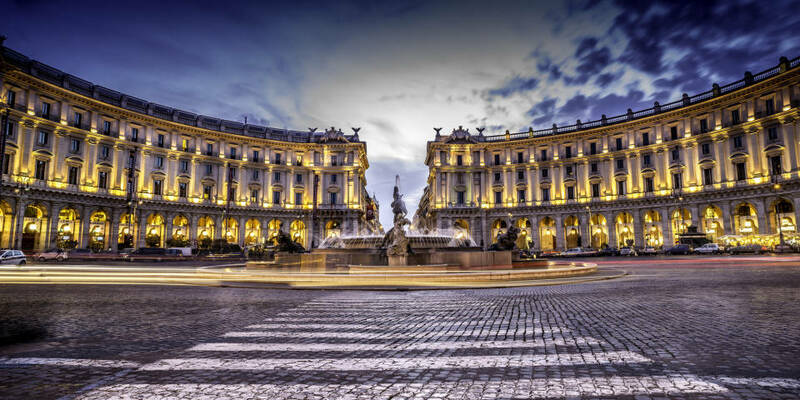 The fountain was originally located on the via del Corso, near the Piazza Venezia. However, in 1874, it was moved to the via Lata. The statue was created in around 1580 and designed by Jacopo del Conte for the Corporazione degli Aquaroli. 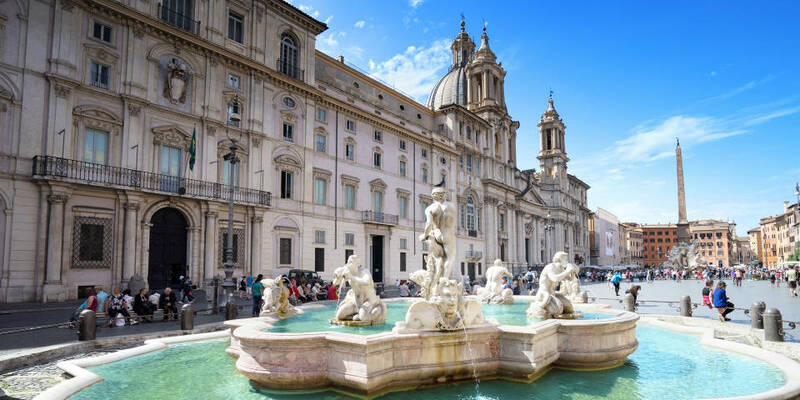 The Eternal City is magnificent and full of different squares and fountains with rich history and impressive decor. 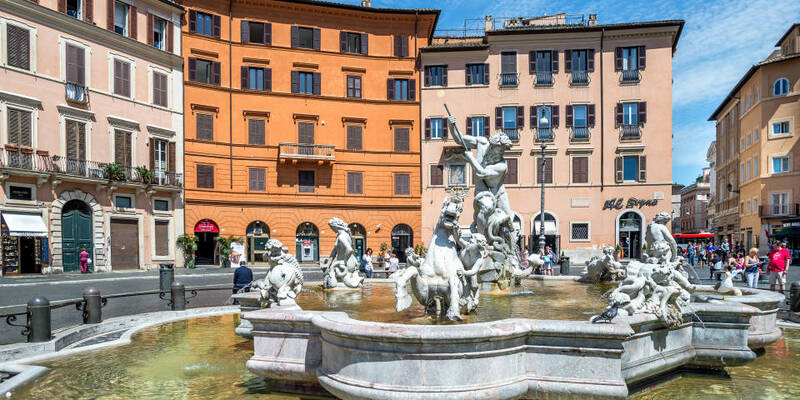 Tell us about your favorite square and fountain in Rome!